So I’m totally in the process of making a cake when the sink breaks. Like falls halfway through, water everywhere kind of a nightmare. Rob calls and some guy is at the door, like minutes later. We totally didn’t expect that. But it turns out this guy that they sent, whose name I still an unsure about, speaks as much English as we do Spanish. Uh oh. We understand that he needs to get a 2×4 and something about somebody’s birthday. I’ve got fondant out on the counter and I’m working it so that it’s nice and smooth and the guy comes back. I have a few things in the sink on the “good” side and he’s tossing them left and right. I’m worried about my cakes getting dirty dish water on them but this guy seems totally nonplussed and he gets to work so I decide I had best get back to work, too. I must say that I’m a bit disappointed in the quality of my cake. Though all of this was going on I had all of this stuff out and about on the counters and it was in that weird right in the middle part where I felt like I had to finish it right then and get out of his way. I rushed and this is something that you should take your time with and have fun with it. But in the end it turned out okay and it was still edible so I guess it’s still a win. Before we get too far into this to make cakes you can have a gazillion different tools. And I used to have them. From special fondant tools to a fancy fondant rolling pin and they make things easy but they aren’t necessary. Since I don’t have that stuff anymore and didn’t want to buy it all over again I went ahead and decided I would make it work with regular kitchen items. If you have the tools use them but if you don’t this is a great way to see if you might want to start investing in some of that stuff for future fondant cake projects. 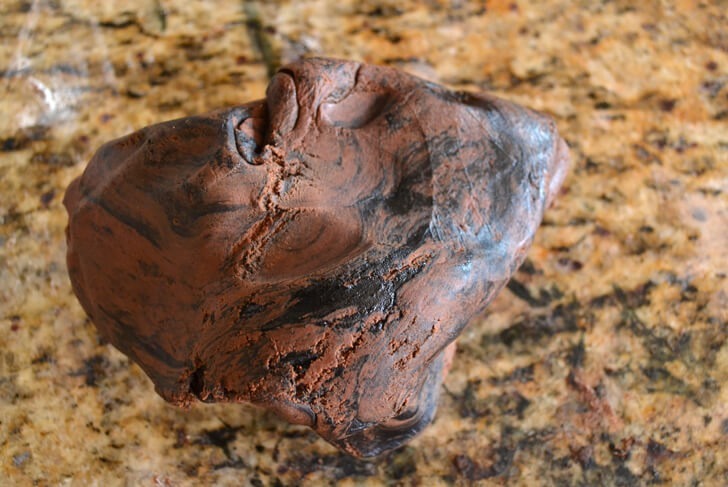 Now Rob says my chocolate fondant tastes a lot like a Tootsie Roll and he should know because he ate quite a bit. I think he ate more fondant than cake, truly! 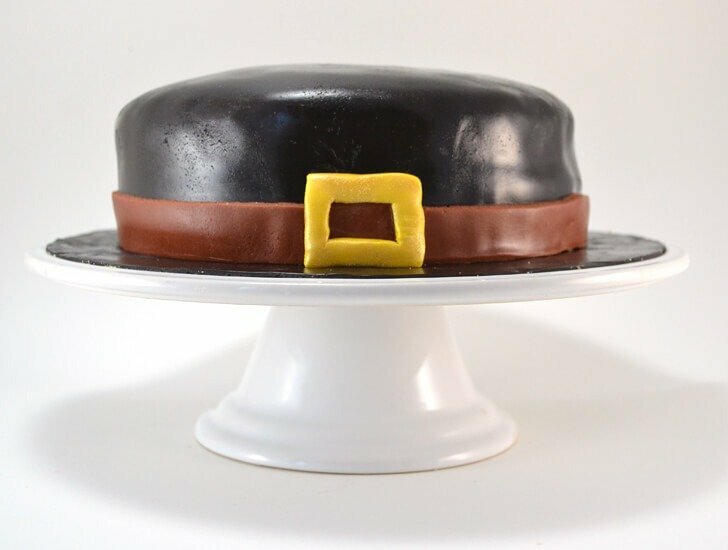 Because Pilgrim hats are black and food coloring can taste like the devil we’re going to start with chocolate marshmallow fondant which is already darker than the regular white marshmallow fondant. 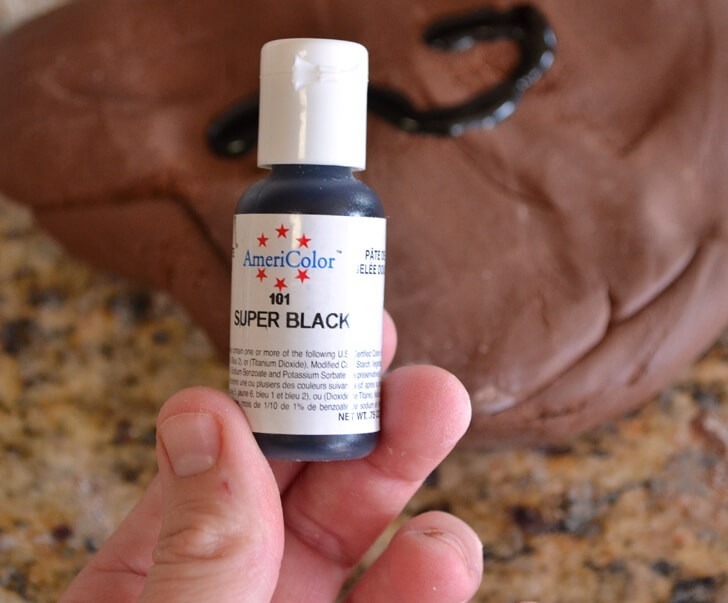 I’m using super black by AmeriColor so I don’t wind up using tons of food coloring. Even still if you have really cheap black coloring you might wind up using a bit more than you’d like. 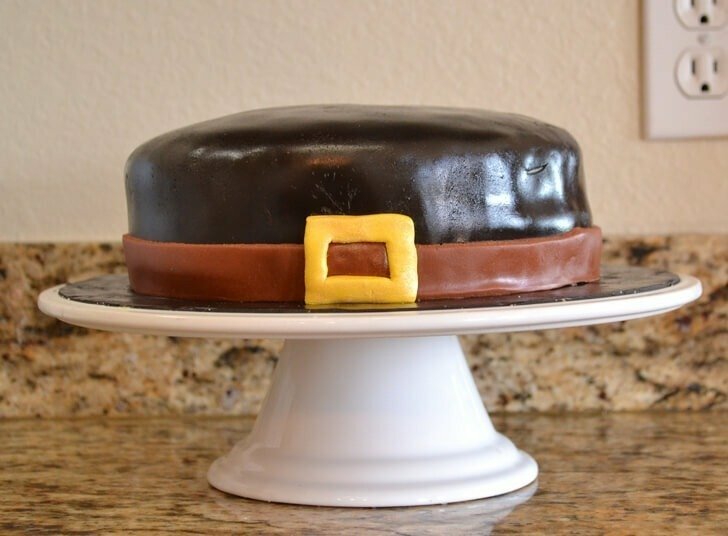 If you do notice you’re using a bunch, I’d say go with a dark brown Pilgrim hat instead to keep good flavor in your fondant over a good color for the hat. Right after making your fondant go ahead and mix in the black food coloring. It doesn’t have to be straight black when you’re done. A really dark brown is great because it gets darker as it refrigerates. Don’t know why but it seems that is the way it always works! Bring your chocolate and white fondants out and allow to reach room temperature. 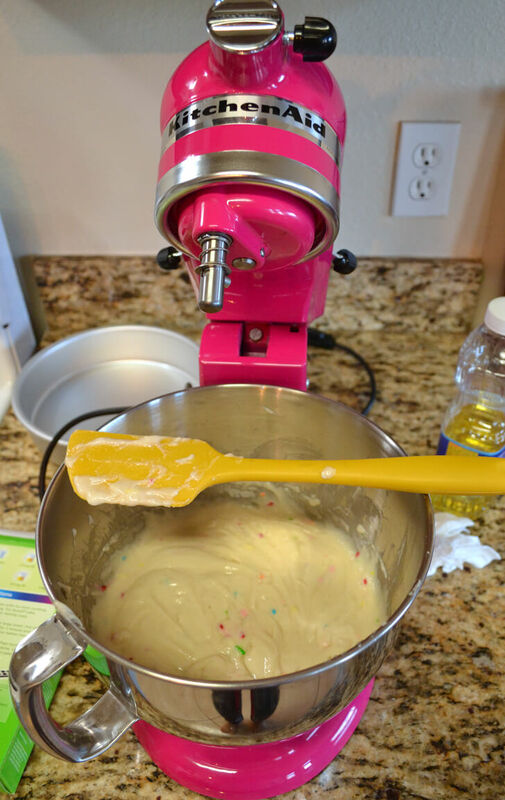 Mix up your fave cake batter (HELLO gluten free Pillsbury Funfetti!) or best recipe. 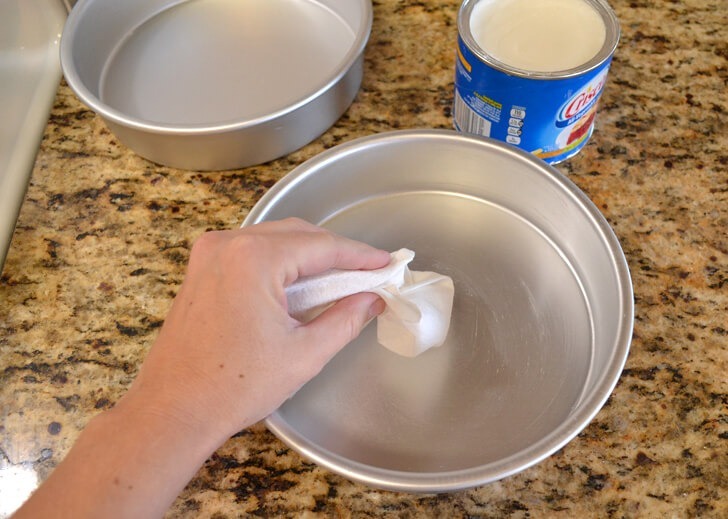 Grease your pans well. If GF you can use shortening or butter and dust with gluten free flour mix. 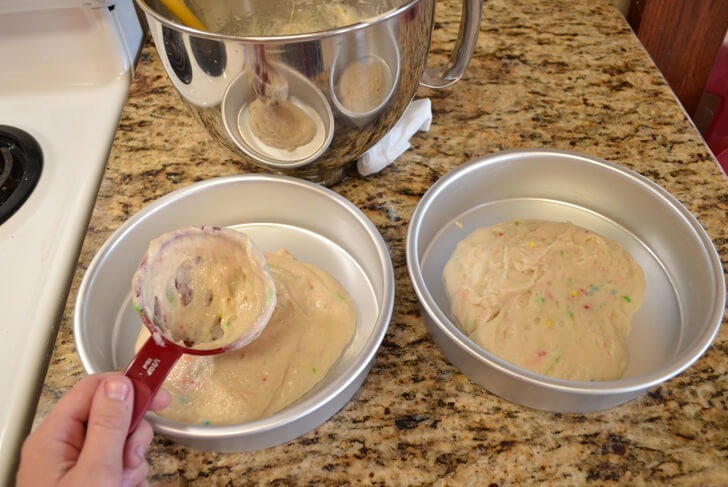 To get cakes that are similar in size use a measuring cup to equally divvy the batter between the two pans. 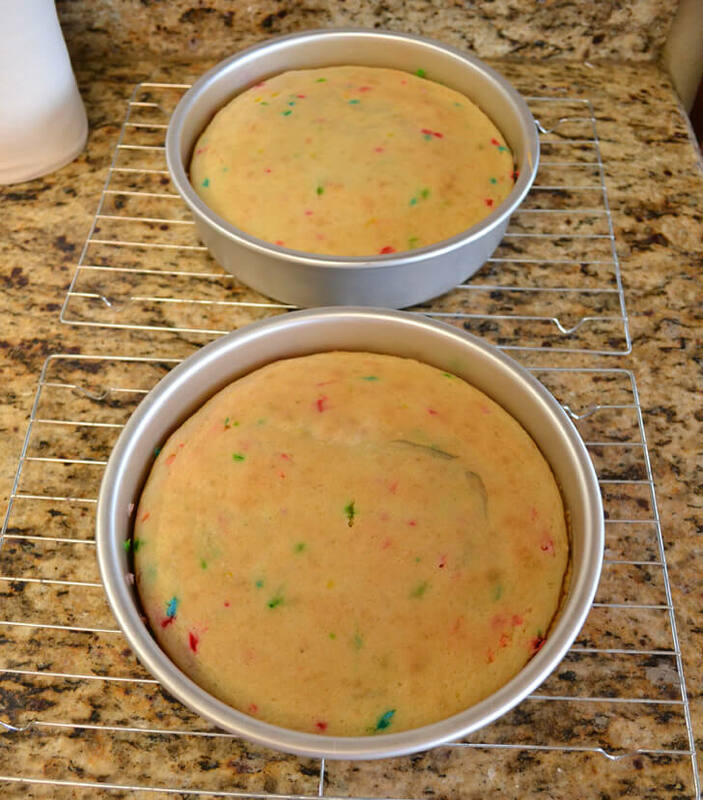 Bake and allow to cool completely. NOW. I did this before I brought my fondant out and I waited FOREVER for it to get room temperature. 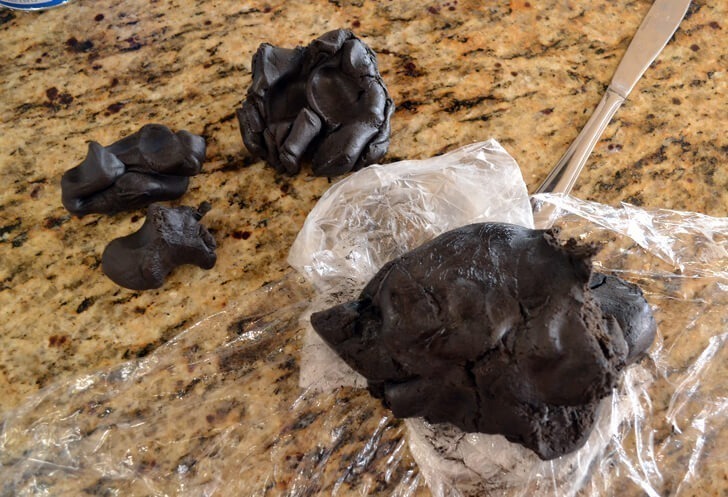 I’d really recommend getting the fondant out before you start preheating that oven! 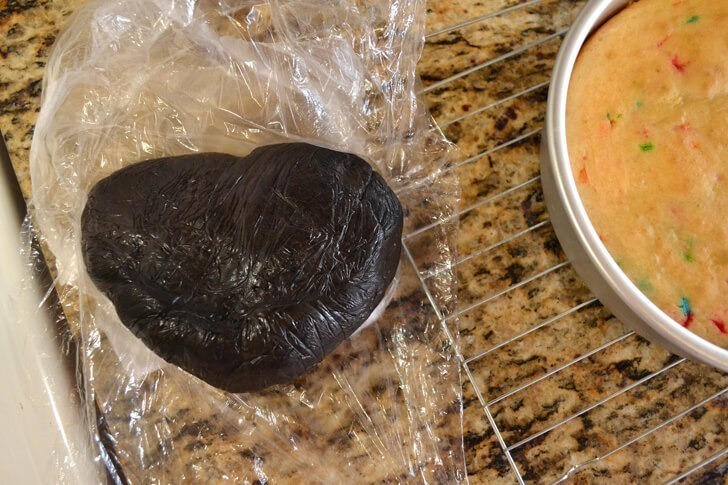 Because it will still be a bit cold and chocolate marshmallow fondant seems to be more stiff than the white version it helps to start softening in small batches. Add the small batches together to form a bigger batch and you’ll have it nice and smooth in no time. The consistency is a lot like a stiff play dough or maybe clay. 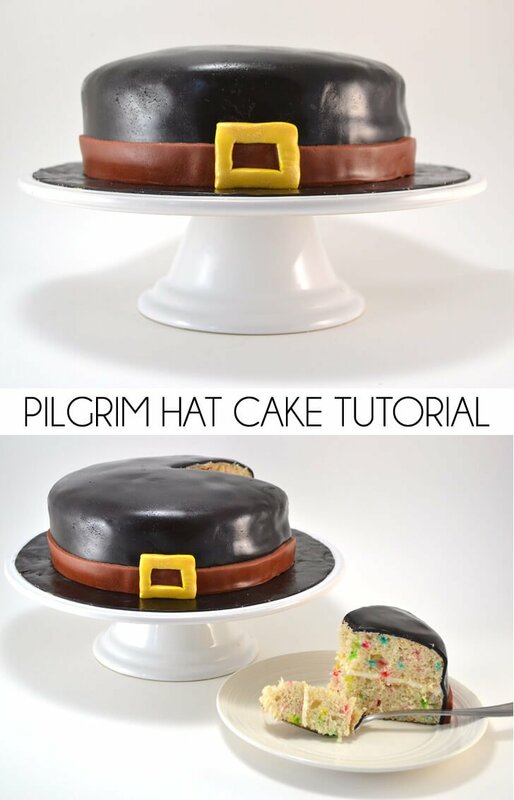 Place your cake platter on top of the fondant. 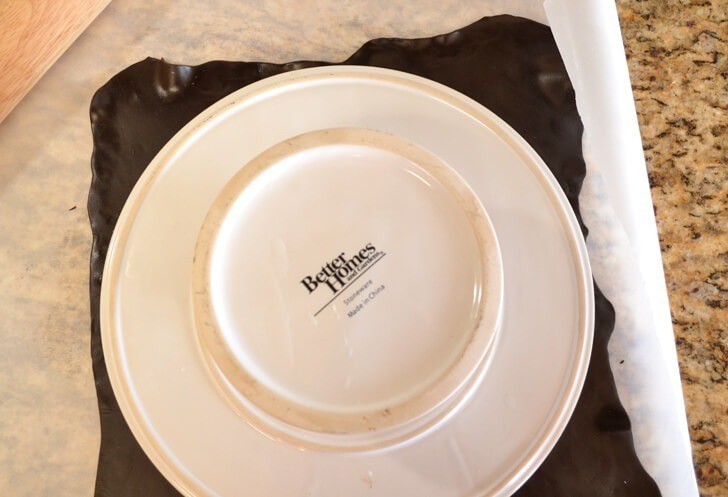 Scootch your hand under the parchment and flip up and over with the plate. Use a knife to trim into a circle. 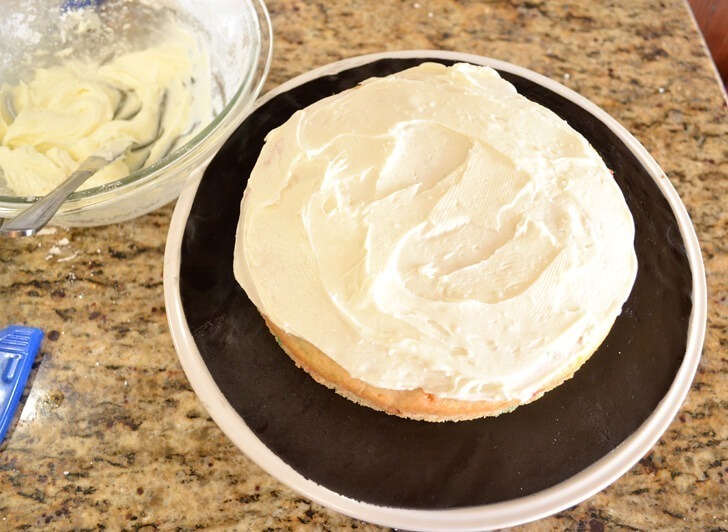 Place your first tier of cake onto the center of the fondant on the cake platter. Ice the top of the cake. Add your second tier. 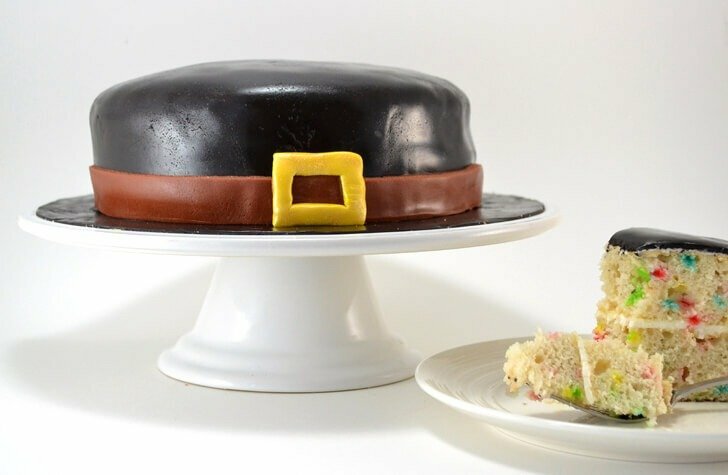 Now, in fancy cakes you would normally trim your cakes so that the tops were nice and flat BUT a hat is not flat, it’s rounded. Lucky us we get to just ice the cake as is! 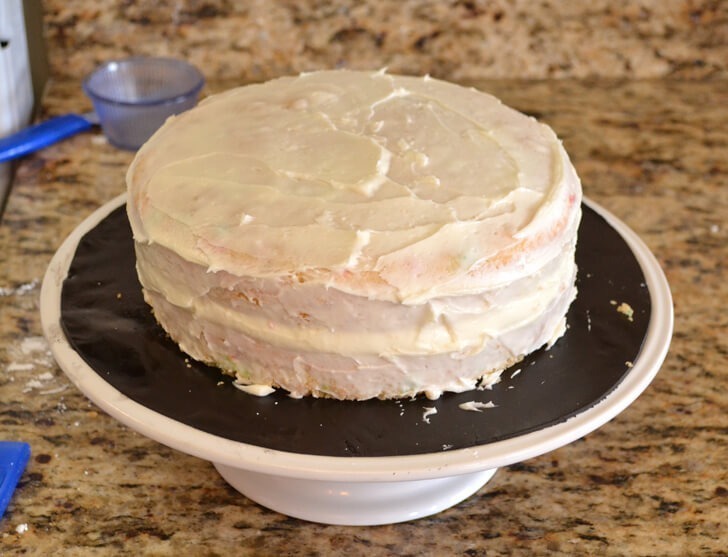 Run a thin coat of frosting all around the outside of the cake. This will act like glue for the fondant to stick to. 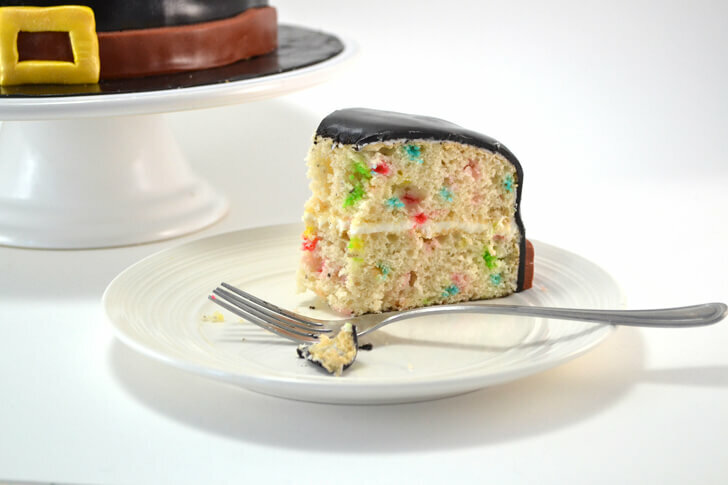 If you make a mess on your fondant, no worries. It’s dry and you can brush it off here in a bit. 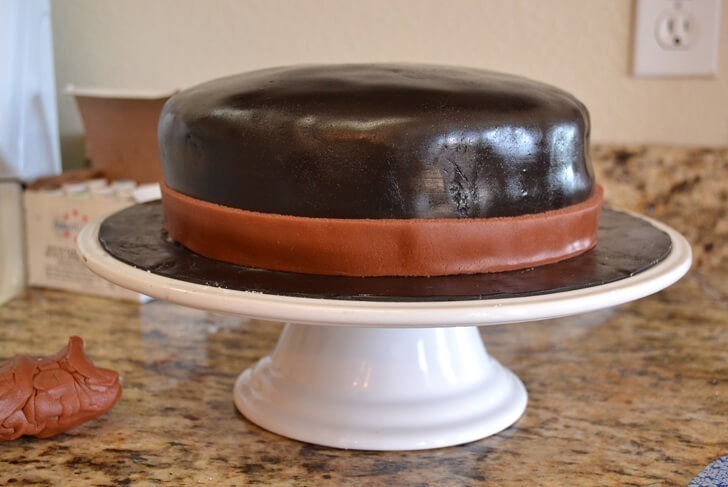 Roll your second half of fondant out into a circular shape and place on top of your cake. 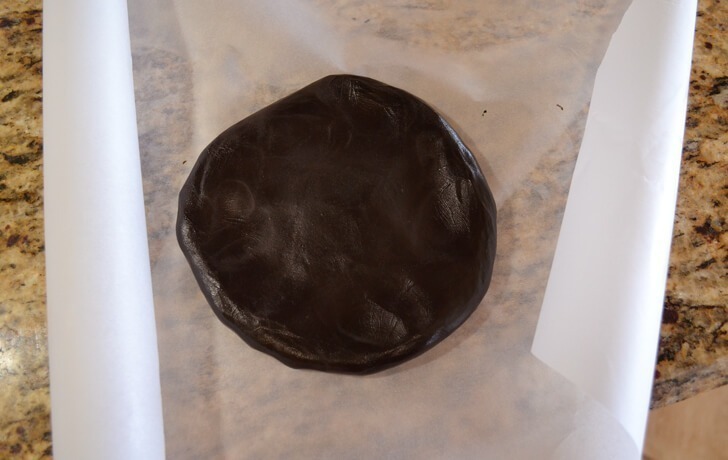 If you use parchment paper again you can easily pick the fondant up off of the counter without worrying about tears or trying to get all fancy and catch it with your rolling pin! 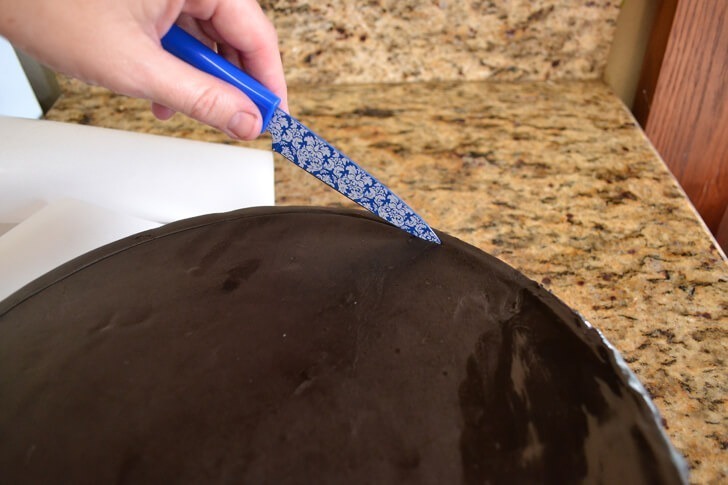 Use your hands to smooth the fondant out as best as you can and work out the sides where it will want to wrinkle up. It seems crazy, but you can totally smooth it out no worries. 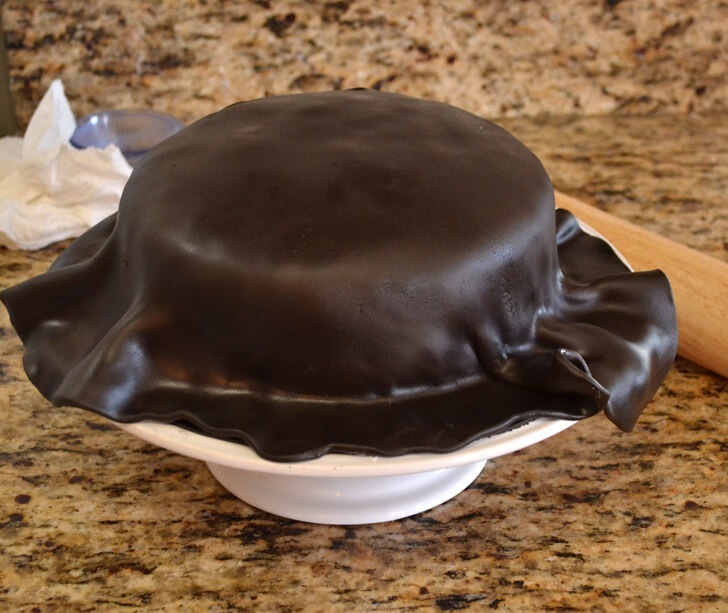 If you manage to tear your fondant don’t panic. Use some vegetable shortening on your finger to smooth back together. 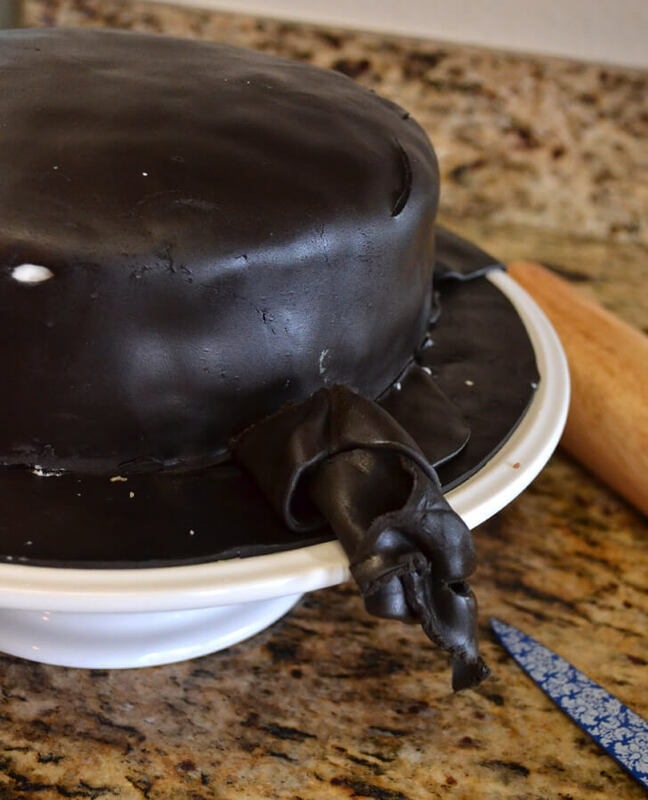 Trim the excess fondant away where the “hat” meets the “brim”. 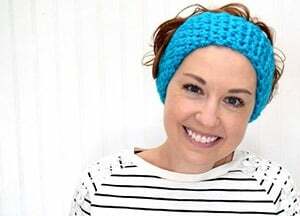 Color some white fondant to your choice for the hat band. I went with brown because, you know, I’m crazy like that. You can also reserve some straight up brown from your chocolate fondant but I didn’t think that far ahead! 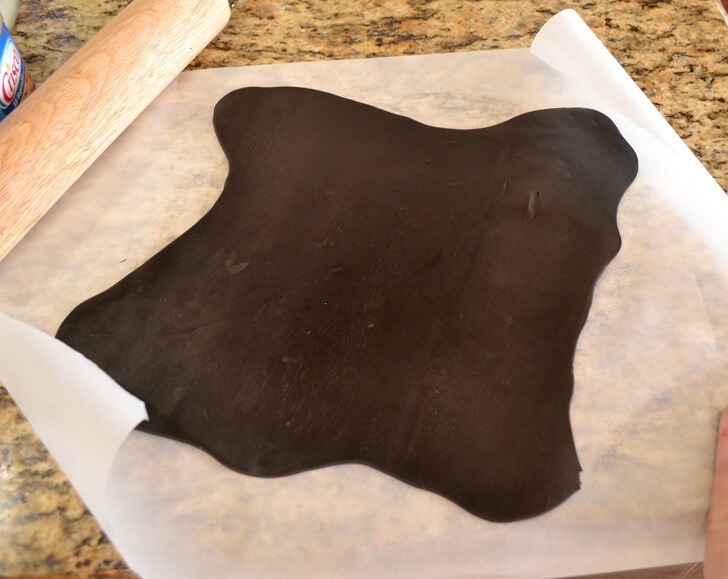 Roll your fondant out and cut a looooong strip. Run around the base of the hat sitting on top of the fondant brim. 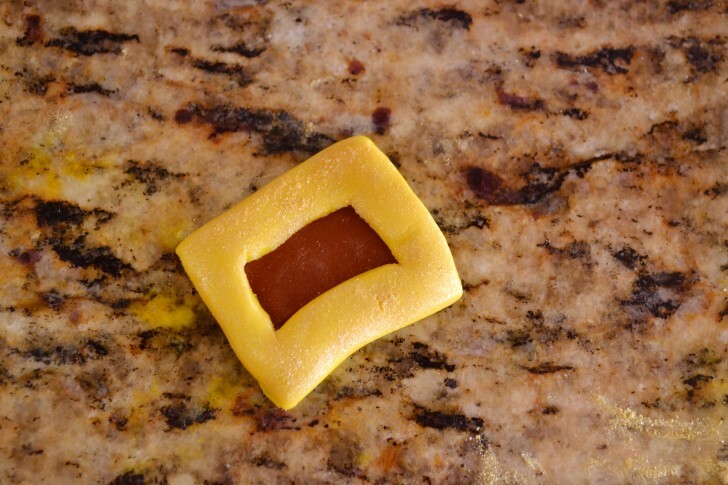 Work some yellow into a small amount of white fondant and cut out a rectangle and another rectangle from the middle. My goal was to use nothing fancy so I went straight with hands and a kitchen knife but if you have square or rectangular graduated cookie cutters feel free to get after it! 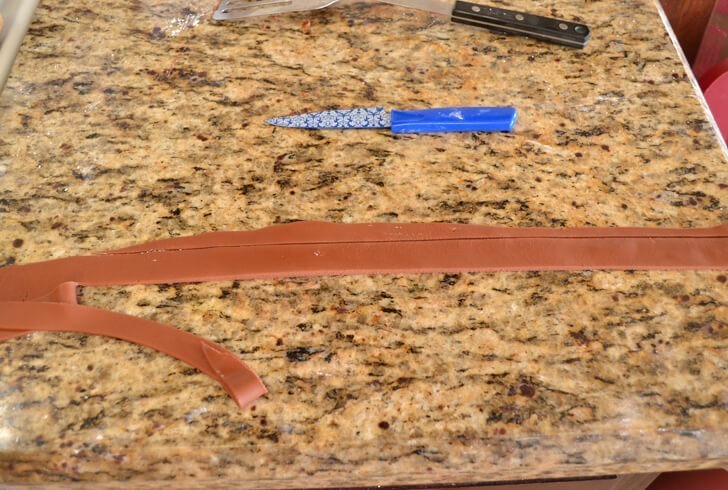 Put your buckle onto the hat band and use vegetable shortening to fix any tears by rubbing the pieces together with your fingers. 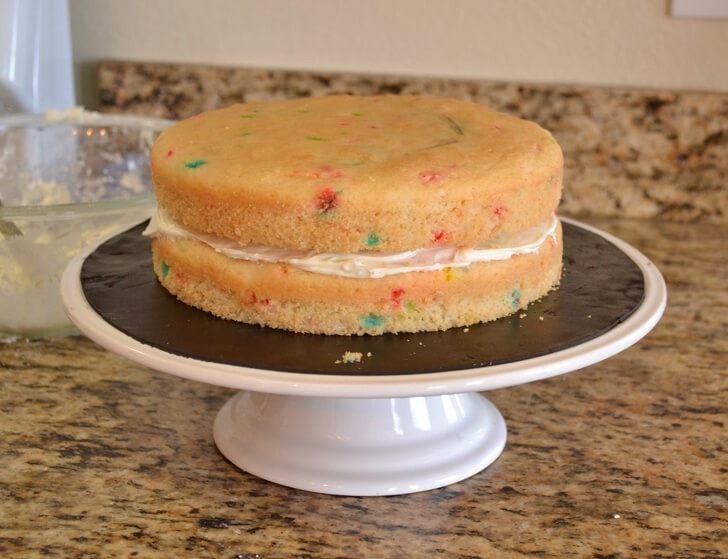 I used a box cake mix because it’s fast and easy AND I was kind of trying to go for an easy approach considering the decorating is going to take a bit more time. This may seem like a crazy project but it really is doable and if using a box mix makes you more comfortable with it then I say get after it. 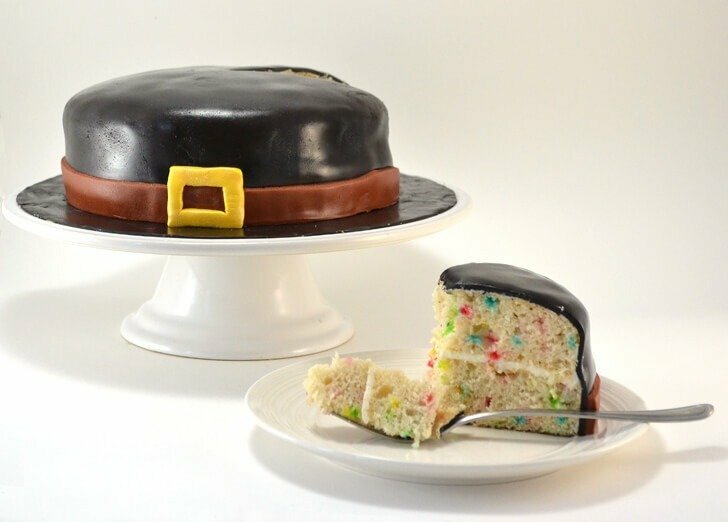 For that Pilgrim hat cake actually had a Pilgrim turkey sat atop it with his own Pilgrim hat, white collar, musket and sign that read “gobble till you wobble” :) I made it out of Rice Krispy Treats, homemade fondant and homemade gum paste. Oh Allison, I’m so sorry to hear about your poor customer service experience here. That is just so wrong. One can’t even trust someone to come into their home, and do their job without worrying about being robbed or ripped off. I always try to hide any of my valuables when I know that something is going to be serviced in our apartment because you just never know… This is especially true when it comes to my money, which I’ve been saving in coin form for over two years. Sad as it may sound, I just don’t want to be ripped off. People are so freakin’ dishonest these days!